The Department of Paediatric Surgery at the University of Cape Town has made a remarkable contribution to the academic body of knowledge of Paediatric Surgery both in South Africa and around the world. It has played a key role in the development of the specialty in South Africa and through the South African diaspora has trained many paediatric surgeons who have made their mark internationally. More recently it has become a major focus of teaching and training for African paediatric surgeons. This article traces this legacy through its origins in the early 1920s to its current prominent position in the world paediatric surgical community. Public awareness in South Africa (SA) regarding the special needs of sick children was awakened by the human tragedy and suffering that followed in the wake of World War I, which claimed an estimated 16 million lives, and the post-war influenza epidemic that swept the world in 1918, killing an estimated 50 million.1 The socio-economic problems of that time and the fact that there was no separate provision for children in various government hospitals were the driving forces behind endeavours to give children a rightful place. The establishment of children's hospitals reflected the work of early pioneers, mainly socially conscious women, who overcame prejudice and resistance from provincial authorities and from those accustomed to catering only to the needs of adults. By succeeding in their efforts they underscored the importance of Paediatrics, and subsequently of Paediatric Surgery (PS), as a major discipline. In 1948 Dr Louw was put in charge of all 28 general surgery beds for children at GSH, consolidated into a paediatric surgical department in 1952. Professor Jannie Louw came to be regarded as the Father of PS in SA. When RCWMCH opened in 1956, 50% of the beds were allocated to surgical patients, an acknowledgement of the new philosophy and the urgent need for such facilities. Significant progress in medical sciences was made during the early 1950s to the mid-1960s. The development of new surgical techniques and the increasing interest of surgeons who chose to specialise in PS were responsible for the survival of children with conditions that previously had proved universally fatal. The nearly 100% mortality for serious congenital defects was reduced to less than 20%.8 In 1961 another milestone was reached when a special intensive care unit of 8 beds was opened at RCWMCH. Sidney Cywes was the first surgeon in SA to restrict his practice entirely to the surgical care of children and in 1975 he succeeded Professor Louw as Head of PS and was appointed to the newly established Charles F M Saint Chair of PS at UCT. Two other surgeons, Arnold Katz and Ryno van der Riet, both in private practice, took on the care of children with osteitis and thermal injuries as part-time staff of RCWMCH. This was the era of steady recognition of PS as a subspecialty, requiring 2 years of training following attainment of the general surgical fellowship, culminating in registration by the then South African Medical and Dental Council in 1984. During this period rapid advances were made in diagnosis, investigation, management, prognosis and understanding the causation of diseases. The emphasis was increasingly on the holistic care of the surgically ill child, in particular newborn infants and patients undergoing major surgical procedures. Disease patterns also changed and the volume of work rapidly increased. It was also during this period that surgical wards and outpatients clinics became progressively racially integrated. Theatres had never been segregated and from 1980 the intensive care units (ICUs) were amalgamated. Accident Prevention Foundation of Southern Africa was established in 1978 to raise awareness and focus attention on the devastating effect of the trauma epidemic on children. A day-case surgical unit was opened in the 1960s and was consolidated into a Day Surgery Unit in 2000. Further consultant PS appointments were made and subspecialty services were developed. Furthermore part-time staff made significant contributions to development and function of the department through assistance with teaching and patient care. The rapid progress in PS also led to the establishment of dedicated paediatric anaesthetists, paediatric surgical nurses and stomatherapists. The period from 2006 onwards is characterised by the modern technological world of digitalised theatres, minimally invasive surgery and advanced training in a skills laboratory. In 2007 PS came of age when it was registered as a full specialty in its own right with the Health Professions Council of South Africa. The specialty now demands a 6-year training period in an accredited academic paediatric surgical department, with an exit examination and dissertation. Seven trainees have so far qualified as paediatric surgeons. Despite all modern developments to which the department has rapidly adapted, PS is faced with challenges posed by the large number of sick children, the disease patterns specific to this region, late presentations, advanced pathology and financial constraints. Paediatric surgeons recognised from the beginning that they were confronted not only by common diseases but also by the surgical pathologies that afflict children in the developing world. Scientific and research efforts were accordingly directed towards finding solutions to these problems. RCWMCH's exceptional contribution to PS is underscored by the large number of overseas surgeons seeking postgraduate training in the department. Since its opening in 1956, it has hosted 27 trainees from England/Europe, 23 from sub-Saharan Africa, 7 from Israel, 6 from the Americas and 3 from the Far East. More than 90 surgical fellows have trained in the department over 5 decades, many of whom have filled Chairs of PS or became heads of departments in their respective countries (including SA, Canada, Argentina, Brazil, Paraguay, the USA, England, Northern Ireland, Australia, Iran, Taiwan, Turkey, Israel and several countries in Europe). Many trainees have made major contributions, particularly in the fields of neonatal surgery and oncology while in SA or upon return to their country of origin. Since the early 1990s postgraduate trainees from sub-Saharan countries (Cameroon, Cote d'Ivoire, Ethiopia, Gabon, Kenya, Zambia, Malawi, Nigeria, Tanzania, Madagascar and Uganda) have undergone training at RCWMH, returning home often to become the only trained paediatric surgeon in their home country. Paediatric surgeons from RCWMCH have received numerous prestigious honours from national and international societies and colleges, and have served as international visiting professors, as members of executive committees of international organisations and as presidents and secretaries of the British Association of Paediatric Surgeons (BAPS) and the World Federation of Associations of Paediatric Surgeons; they were the driving force behind the establishment of the South African Association of Paediatric Surgeons and the Pan African Paediatric Surgical Association. Professor Sidney Cywes was only the second paediatric surgeon in the world to receive an Honorary Fellowship of the College of Surgeons of America. In addition he was also awarded an Honorary Doctorate of Science in Medicine from UCT. A J W Millar was awarded the coveted Denis Browne Gold Medal from the British Association of Paediatric Surgeons, for outstanding contributions to paediatric surgery; Professor A B van As received the prestigious Micheal van Flooten Medal from the Dutch Surgical Society, and Professor H Rode was honoured with the Zora Janzekovic Golden Razor Award in recognition for outstanding contributions to paediatric surgical burn care. 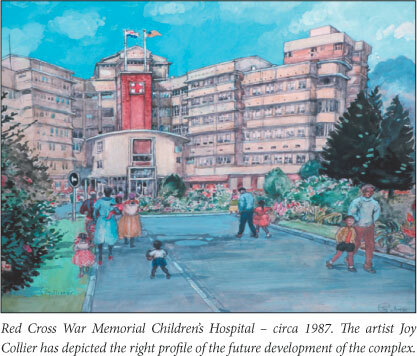 Much of the history of PS in SA is reflected in the writings of the paediatric surgeons from RCWMCH: J H Louw, Sid Cywes, Mike Davies, Heinz Rode, Alastair Millar, Rob Brown and Alp Numanoglu, and of the many who spent their formative years 'in the shadow of Table Mountain'. Collectively they have contributed 4 textbooks, over 150 book chapters and more than 1 000 peer-reviewed publications to the literature on PS. Working and living in Africa calls for a particular dedication to serve the children of this country and this continent, a commitment which these children desperately need and so richly deserve. For more than half a century many idealistic men and women have fought for the interests of children. UCT celebrates their philosophy, their achievements and their teachings. It is incumbent upon the current and future generations to continue to build on the solid foundations that have been laid by our forebears. 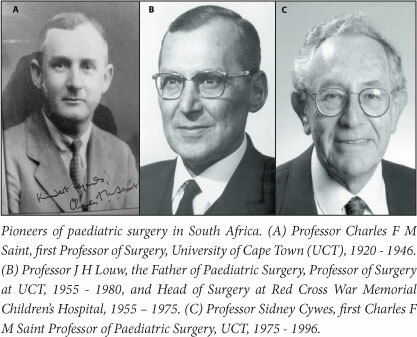 South African UCT Paediatric Surgical Alumni who have made significant national and international contributions here and overseas include Barry Shandling (1957 - 1961), Hospital for Sick Children, Toronto, Canada; Johan Jacobs (1961) Pretoria; John Beck (1972 -1973), Leeds, UK; David Lloyd (1970 - 1972), University of Natal, Durban, Professor of Paediatric Surgery, Liverpool, UK (1988 -2004), and President of BAPS (2000 - 2002); Don Nuss (1971 -1972), Norfolk, Virginia, USA, who described the Nuss procedure for pectus excavatum; Mike Davies (1969 - 1983), Professor of Paediatric Surgery, University of the Witwatersrand (1984 - 2004); Sam Moore (1986 - 1992), Professor of Paediatric Surgery at the University of Stellenbosch (1992 - present); Kokila Lakhoo (1990 -1992), Baragwanath Hospital, Johannesburg and Radcliffe Infirmary, Oxford, UK; Colin Lazarus (1992 - 1993), Head of Eastern Cape Paediatric Surgical Services and Professor of Paediatric Surgery, UNITRA; Janet McNally (1995 - 1996), Bristol, UK; Esme le Grange (1999 - 2002), Bloemfontein, Head of Department of Paediatric Surgery (2003 - present); and Jonathan Karpelowsky (2006 - 2009), Sydney, Australia.